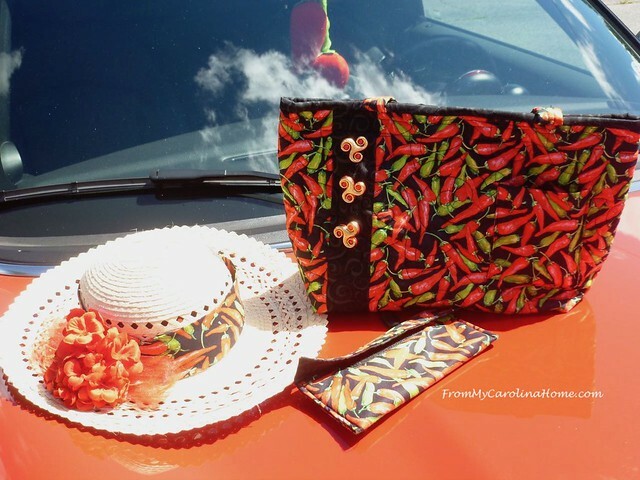 Having some fun with the Caliente theme, I made a few fun things to use on drives with the Mini club like the Geocaching Drive on yesterday’s post. For those who missed that post, one of the club ‘rules’ is you have to name your car. Ours is red, so DH called it Caliente. You can see the chili peppers hanging from the mirror that he put up when it is parked. I reworked those from dog toys. 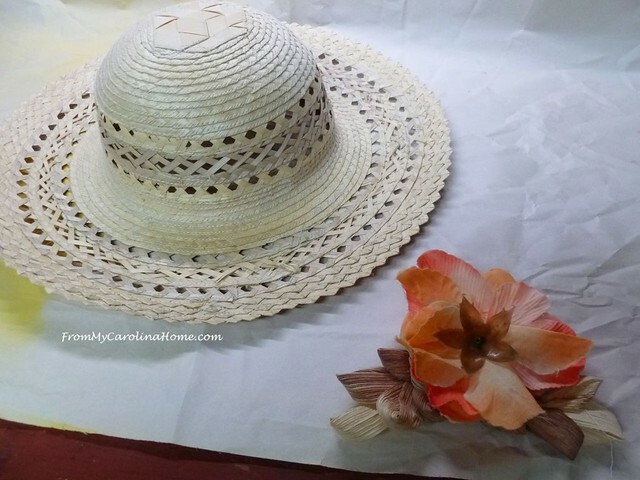 Today I’ll show how I reworked a thrift store hat to fit the theme, and next time we’ll begin the purse. Here’s how it started, with an interesting weave on the hat itself, and a small flower decoration. 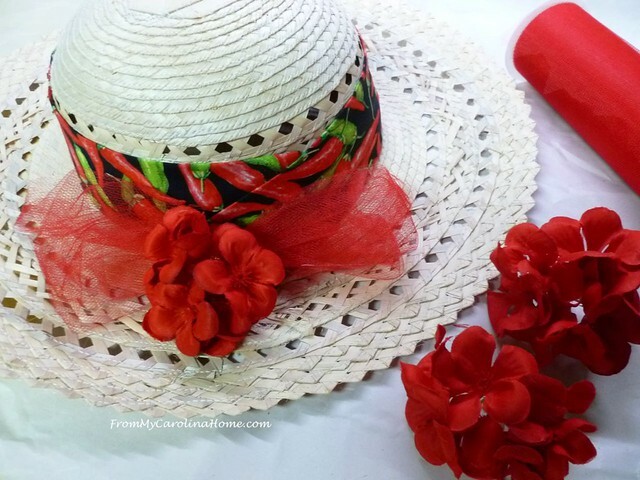 I look for hats in thrift stores as they are much more affordable. If it fits, and is in good condition, I get it. I can make it look any way I like with a few easy steps. Warming the glue with my heat embosser, the flower lifted off quickly. 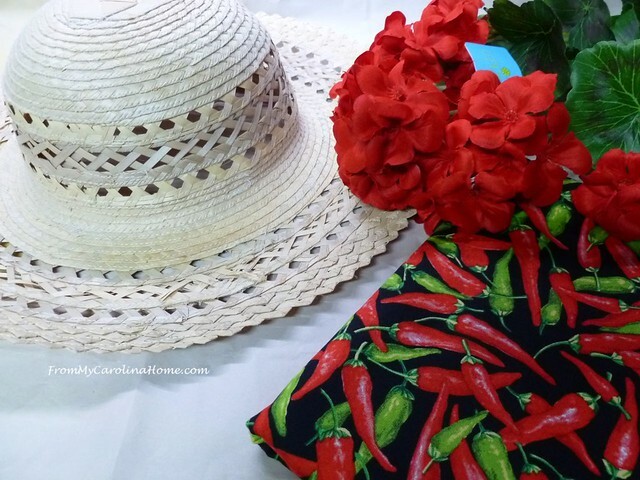 Some red silk flowers from the stash and the chili pepper fabric were gathered together. 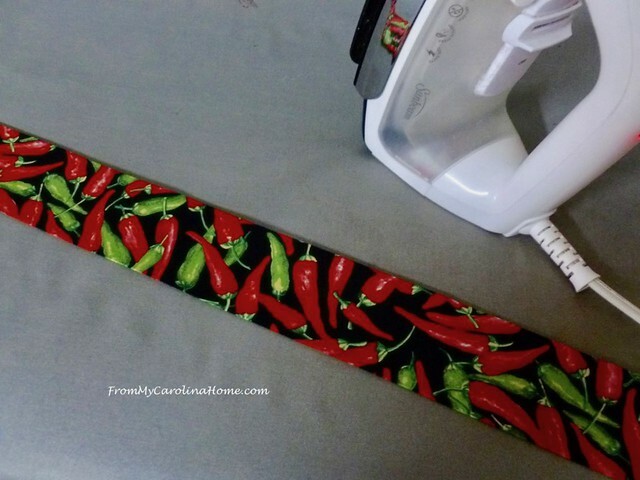 Cut a strip of fabric, and sew the edges right sides together to form a tube. This would make a finished edge on both sides. Glue the strip around the base of the crown of the hat. Overlap the ends. Pulling the top edge down a little helps to snug the fabric against the crown. It needed just a bit more, so I added some tulle too. Tie the tulle into a bow, and glue to the back side. Glue the flowers into place, on top of the tulle bow. Add two more flowers to complete the look. And there it is. 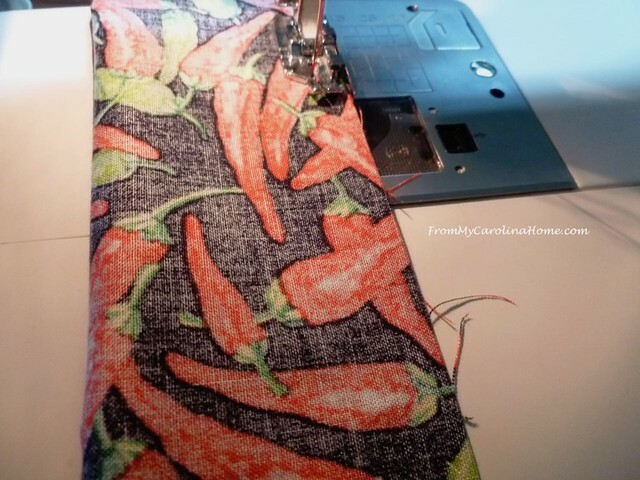 The red color of the flowers brings out more of the red peppers in the fabric. Wearing a hat on our drives and shows keeps the sun off my head and out of my eyes. 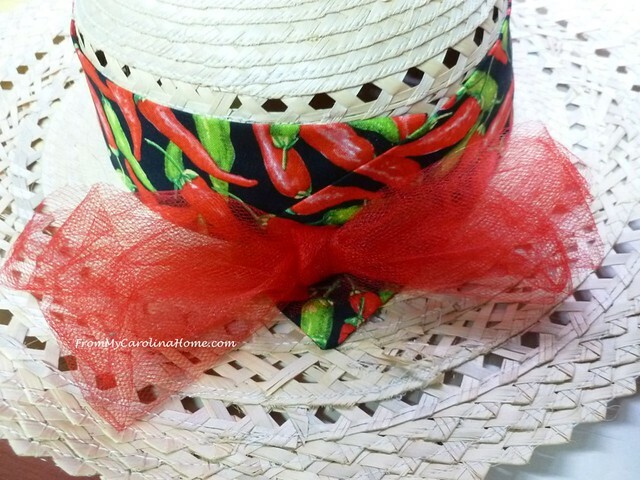 See more of my hat projects on these posts – here, and here. Do you like to wear hats outside? What are you crafting this week? Thank you for using my links when you can. Craftsy Project Kits on Sale! Your hat has given me a clue as to what to do with my white hat that looks a bit more lacy so I’m going to go with a magnolia flower on mine with a bit of silk from an old tie and I think I’ll make it so I can change the color of the tie and make the flower a pin so I can change it to go with different outfits for the Summer. Thanks for sharing. 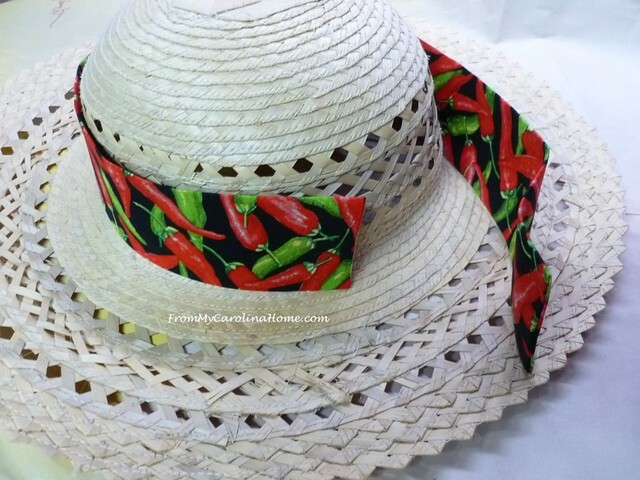 Hello Carole; I am in love with your new hat! 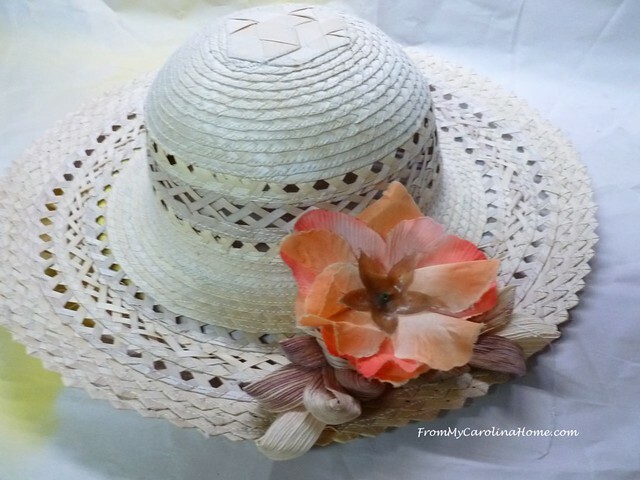 Plus, reading your fabulous tutorial has given me some great ideas for my hat that is in fine condition but is BORING! 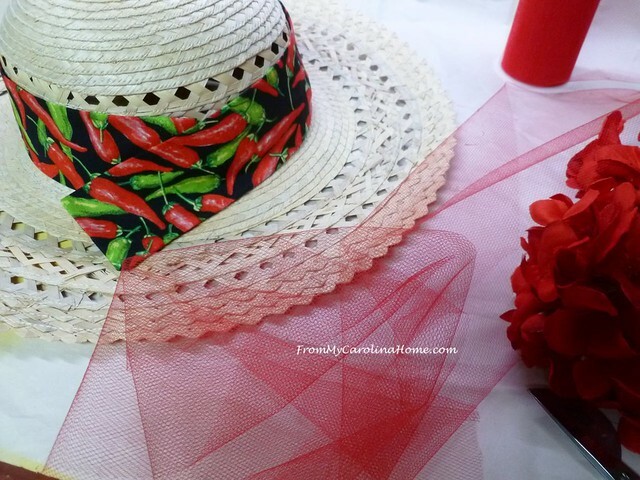 How could I have forgotten all of your other great posts on fixing your hats up….just do not know; but sure am glad that I have a gazillion additions that I can use from items for fixing up wreaths all the way to my fabric stash. I may even have to go and buy me a few more hats for the summer and fall. Since my accident, the sun has always enhanced my headaches, so I wear a hat quite often. Thank you so much for sharing your brilliant creation for your lovely hat! I truly do love it! Have a fabulous day and or evening, since I am posting rather late. That’s a really cute hat, Carole! I love the fabric you chose (and the hat was a good shape to begin with). It just dresses it up and looks pretty darned adorable and fun! I just added your blog to my bloglovin’ reading list. I see so many things here I think I will truly enjoy! I really love the banner photo of the redbuds at the top of your blog. The terrain reminds me a bit of where Rick’s dad is in Banner Elk, NC at the top of Sugar Mountain. It’s so beautiful — I love the mountains. Michigan is very flat! Fabulous, can’t wait to see the next caliente post! That hat is too cute for words. You are so clever. I have no place to actually wear a hat, so I don’t make them. I used to love wearing them when I was in college. Not to class, of course! That’s a great tutorial, thanks. I’m not crafting anything right now! 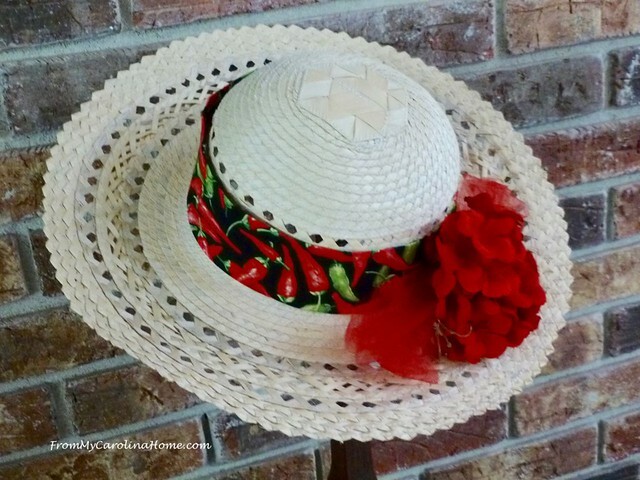 Such a great redo on the hat and being a thrift store find makes it even better! So creative and just plain cute, Carole! Thanks for sharing at Vintage Charm!